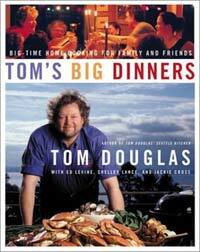 Tom’s Big Dinners is a warm and personal collection of 13 menus for entertaining from award-winning Seattle-based chef, Tom Douglas. Family and food go together for Tom Douglas, and everyone pitches in to create full-flavored dishes for some pretty memorable feasts… A Chinese Feast, which boasts 12 recipes; Grandpa Louie’s Dream Greek Vacation, 11 recipes; Pop’s Winter Solstice, starting with Pop Pop’s Perfect Martini and Caramelized Fennel Tart, followed by Creamy Seafood Chowder and Parsley Scones. Tom loves to fire up the grill too… Pit-Roasted Pork Spareribs; Charred Squid Skewers on Garlic Toast with Arugula and Vine-Roasted Squab with Syrah Jam are just a couple of feature dishes. Not your standard fare, the dishes in Tom’s Big Dinners require some planning and help in the kitchen, but Douglas provides plenty of tips to get most cooks through easily. And from the cocktails right through to the original desserts (Cornmeal Rosemary Cake with Lemon Glaze; Bitter Orange Chocolate Mousse), the results will make you a star.